In this activity you can define and edit field status variants and groups. You group several field status groups together in one field status variant. You assign the field status variants to a company code. You must define a field status group in the company code-specific area of each G/L account. The field status group determines which fields are ready for input, which are required entry fields, and which are hidden during document entry. Bear in mind that additional account assignments (i.e. cost centers or orders) are only possible if data can be entered in the corresponding fields. Field status variant 0001 is entered for company code 0001 in the standard SAP software. Field status groups are already defined for this variant. To Copy: Select the variant to be copied and choose the option copy from the task bar. While copying change the name of the variant to be used for a company specific. Task: Choose the option copy all if copying from the existing field status variants. What is the use of Field Status Variant in FICO? Fields status variant is used to assign Field status groups when a GL account is created for a company code. Filed status variant will have field status groups. 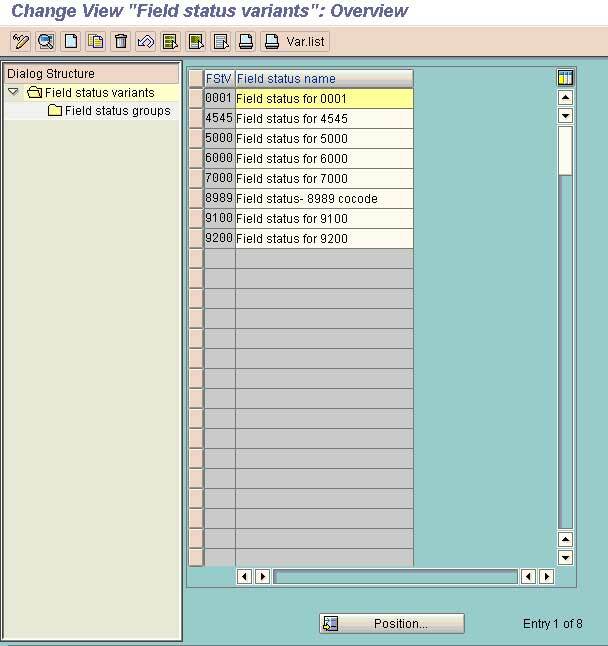 All the Field status groups are clubbed to a Field status variant and Field status variant is assigned to a company code. Field status group is assigned to GL account.Through Field status group one can make a field as optinal, suppresse or mandatory when the postings are made to that GL account. If a Filed status variant is assigned to more than one company code same set of screen field will be displayed while posting those company fields.